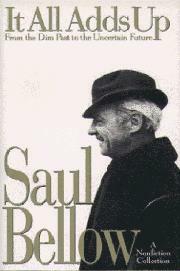 Bellow (Something to Remember Me By, 1991) makes it seem--in his introduction to these essays, addresses, interviews, and journalism pieces--as though he'd been reluctantly corralled into collecting them. And in truth, the individual entries are tied together more by the supple richness of Bellow's wonderful prose than by any greatly compelling worldview. The novelist/recorder/stylist in him always wins out here over the historian of ideas. Maybe the best piece, for its fidelity to place and time and sense of possibility, is the most unlikely: a brilliant, clever, full-hearted consideration of Franklin D. Roosevelt in which Bellow taps into the vein of American optimism and argues that the can-do bravado of Roosevelt is sorely lacking from contemporary American life. Equally fine (if slightly crowing) is a jaundiced dismissal of the mid-century New York intellectuals (the Partisan Review crowd et al.) as having been mere consumers of ideology who always needed to have the latest model of theory in their intellectual garages. The journalism here--reports from Spain, Paris, Israel, Vermont, Tuscany--is light-footed and companionable if hardly inspired. The public addresses (including Bellow's Nobel peroration) are much doughier items; and a pair of later interviews have some nice balletic turns amid flashes of ego that can be a little cloying. But for all his foibles and old ax-grindings, Bellow remains one of the most interesting, if slippery, figures in our literature. Sheen and fascination come off of every page.